Implant Dentist Tacoma, Washington — Implants, introduced in the early eighties, are now the hottest of the dental technologies. They can be used to replace a single missing tooth or a whole set of teeth. 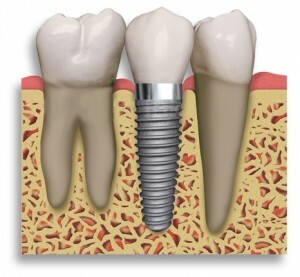 Implants are specially designed pieces of metal or ceramic material that are surgically implanted into the jawbone. In time bone forms around them and they are firmly held in the jaw, much like the roots of natural teeth, except that they don’t have the periodontal ligament to cushion the impact of chewing. The portion that protrudes through your gums can be crowned or used as an abudment for attaching bridges or dentures and partials. If you are interested in the types of metals and techniques that are used, or any other detailed information, your Tacoma dentists at Advanced Dental Care will be able to provide it to you. The success ratio of any type of implant increases if there are natural teeth to help withstand and evenly distribute the chewing forces. For example, if implants alone were used to anchor a full denture they would be taking a bigger load than if you had ten natural teeth to help them out. So if you are contemplating implants, saving as many healthy teeth as you can will be very important. Don’t have any teeth pulled until you consult with your implant dentist. In many cases people are unable to wear conventional dentures because the jawbone ridge can’t retain them. Also, some dentures wearers are unhappy with how dentures look. But now, thanks to implants, dentures are no longer the last resort. Implants not only offer another option, but for many people may be the only choice left. Besides, unlike dentures, they won’t fall out at inappropriate times, like when you are eating. Implants can also be used to replace a single lost tooth or several teeth if you don’t want a bridge because you’d rather not crown healthy teeth. They can be sued, too, to provide additional support for bridges and partial dentures. The placement of implants is complicated. Dentists need a lot of training, experience, and skill to be qualified in this field. Dr. Xu has many years of experience doing dental implants, with great results. Call our office to schedule a FREE consultation session, to meet the doctor and get your dental implant questions answered.